I can clearly remember: It was a hot but humid morning, which is common in this area during the dry season. As we walk through the rainforest, we struggle to keep our pace on the trail – it is steep and the humidity make us feel like we are running a marathon. We come to the last hill and finally reach the ridge of the mountain chain that goes through Piedras Blancas National Park. We summit the top and can see both the dense forest on one side and the ocean in the other. The views are amazing! 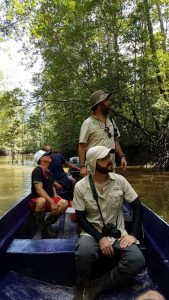 This location on the Golfo Dulce in the Osa Peninsula is part of the property of Saladero Eco-Lodge, where the owners are excited about partnering with us to study Osa’s wildcats. We strategically place a camera trap along their property on the mountain ridge in hopes to obtain photographic evidence of the mammals, especially wildcats, that rely on these habitat routes to travel long distances. First camera trap photo (2014) from Saladero Ecolodge of a jaguar on the property. After leaving the cameras in place for several months, we returned to retrieve the first photographs – the results were revealing! 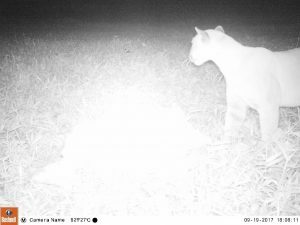 Pumas and peccaries were easily spotted on the footage, highlighting the ongoing vital predator-prey relationship in the area. There were also an array of different mammals, birds and other wildlife. What biodiversity! 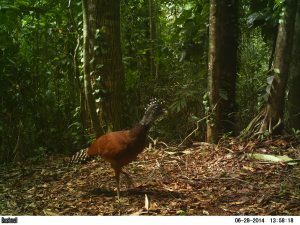 Great Curassow (Crax rubra) caught on an early camera trap in 2014. 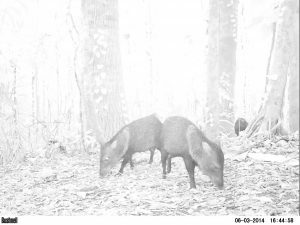 Collared peccary (Pecari tajacu) caught on an early camera trap in 2014. Since placing these first camera traps in 2014, more ecolodges have joined this collective effort. 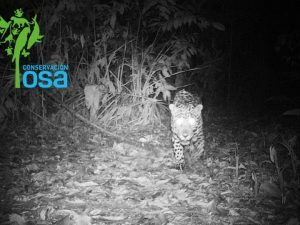 In 2017, partners joined forces around the Osa and launched the “Osa Camera Trap Network” – one of the most diverse and collaborative research efforts in Central America. Year after year, more people have started to notice the importance of monitoring mammal populations that serve to maintain the integrity of these ecosystems. Communities that once only saw ecotourism development from afar, are now becoming a part of it. 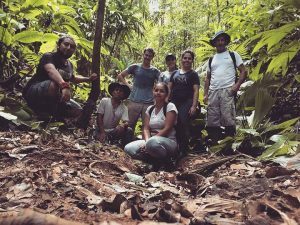 Community groups have formed important fauna monitoring projects and more locals have brought ecotourism to their communities where more people can benefit. 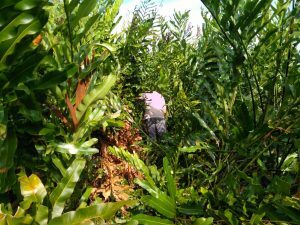 And, most exciting, these local communities – along with ecolodges, private owners, universities, governmental institutions and tourism agencies- have joined together to study the wildcats as part of this important Osa Camera Trap Network. 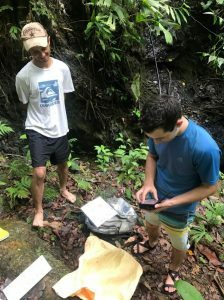 Members of the Osa Camera Trap Network from “Rancho Quemado” installing camera traps. But studying wildcats is difficult. It requires covering large areas and a great amount of manpower. 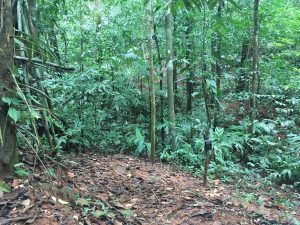 Four years after the installation of the first camera trap in Saladero Ecolodge, I find myself walking through the dense forest in the boundary of Corcovado National Park and the community of “Los Planes.” Guided by two members of the community, we look for a suitable place to install their camera trap station. As we sit on a fallen tree and discuss placing a camera trap at this location, I think how much we have achieved in the past four years in order to make this collaborative region-wide initiative a reality. 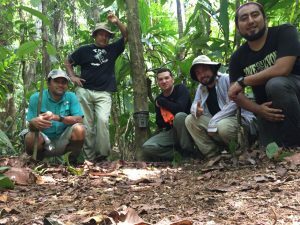 Members of the Osa Camera Trap Network from the community group of “Los Planes” installing camera traps. 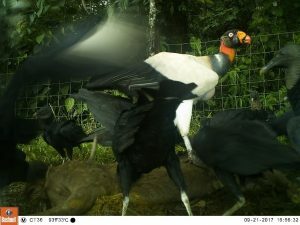 This year, the Osa Camera Trap Network is setting up more than 200 camera traps all over the Osa Peninsula! 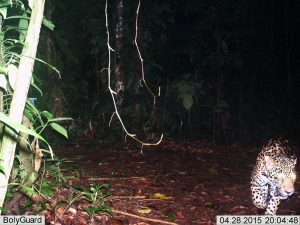 This is the biggest array of camera traps ever carried out in Central America and importantly, it does not just belong to a single institution but rather to a collective group of stakeholders pursuing the same goal: to generate the scientific information necessary to conserve wildcats and prey. To learn more about Osa’s Camera Trap Network, as well as Osa Conservation’s Wildcat Conservation Program, please visit our program website. World Wetlands Day is celebrated on February 2 of each year, the date on which the Convention on Wetlands was adopted. Wetland is all those areas that remain flooded or at least, with soils saturated with water for long periods of time – thus, water defines its structure and ecological functions. Wetlands are vital for human survival. As one of the most productive ecosystems on the planet, they harbor a biological diversity and water sources on which countless species of plants and animals depend for subsistence. 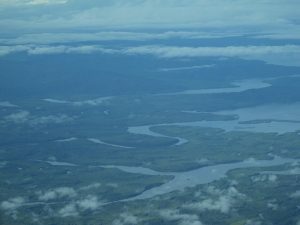 However, the surface and quality of wetlands continue to decline worldwide, so the benefits that wetlands provide to human beings are in danger. Due to the endangered condition of wetlands worldwide, on February 2, 1971, the Convention on Wetlands was adopted in the town of Ramsar, Iran. This convention is the first intergovernmental treaty that serves as a framework for national action and international cooperation for the conservation and sustainable use of wetlands. 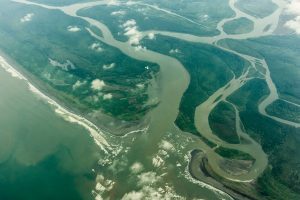 The convention includes lakes and rivers, underground aquifers, swamps and marshes, wet grasslands, peatlands, oases, estuaries, deltas and low tides, mangroves and other coastal areas, coral reefs, and artificial sites such as fish ponds, rice fields, reservoirs and saltworks. 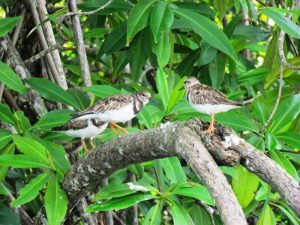 To date, the list includes 2,200 designated “Ramsar sites” covering an area of more than 2.1 million square kilometers, an area larger than Mexico. 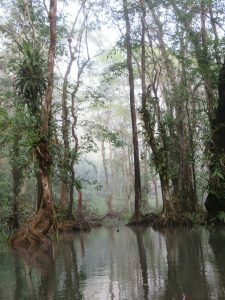 In the case of Costa Rica, about 350 wetlands are reported, which cover 7% of the national territory; 12 of them are considered of global importance and therefore were declared as Ramsar Sites. 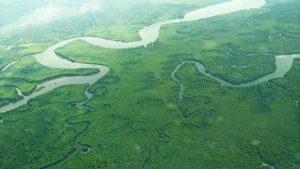 One of these sites is the Térraba Sierpe National Wetland, located in the south of the country, which with an area of 32,000 hectares (79,073 acres) corresponds to the largest mangrove area in the country. 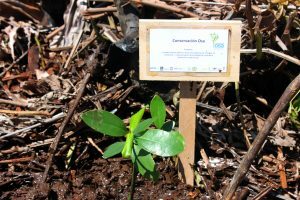 Mangroves are one of the most productive ecosystems on the planet, offering a variety of services such as recreation, tourism, carbon capture, water purification, shelter for living beings and coastal protection. Osa Conservation staff assessing wetlands by boat. Osa Conservation is dedicated to protecting these vital habitats. 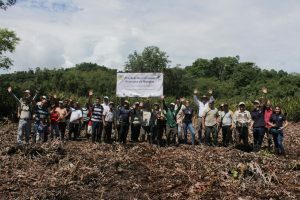 Currently, we are working in the Térraba Sierpe National Wetlands on a project to “strengthen the mangrove ecosystems and improve the quality of life of the coastal populations.” This project will help to actively restore 50 hectares of mangroves, working in conjunction with the Association of Fishermen and Marine Resources of Ajuntaderas y Afines (APREMAA), a local organization that is in charge of establishing mangrove nurseries and preparing the land. In addtion, the project promotes sustainable practices regarding the extraction, processing and commercialization of mollusks in the wetlands. 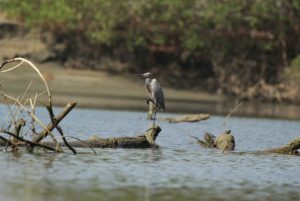 Efforts of this nature seek to preserve the services offered by wetlands through the sustainable use of their resources for the benefit of coastal marine communities. 4:30 am – I rise before the sun has woken up and while the nocturnal organisms are still out. I shove some food into my body in preparation of the day ahead. 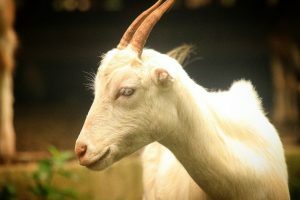 Another volunteer and I are staying at the cabins near the farm, where Osa Conservation grows much of their fresh vegetables, fruits, medicinal plants, and cares for their animals, restoration plots, botanic garden and much more. 5:00 am – After gearing up with our head lamps and day packs, we head out on the main road and walk for 25 minutes to the Biological Station. The stars shine through the trees and the hum of insects is more noticeable. Cars occasionally roll by with people starting their day before the sun’s heat gets too hot. 5:30 am – We meet up with Manuel Sánchez, the Sea Turtle Conservation Program Coordinator. We hike through the woods as the sun begins to rise. 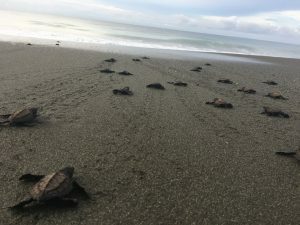 He shows us a taste of what he does every morning to aid the survival of 4 species of endangered sea turtles – Olive Ridley, Green Sea Turtles, Leatherback, and Hawksbill (with the Olive Ridley and Green Sea Turtles being most common in the Osa). We look for threatened sea turtle nests along the beach and, when needed, the team will help excavate and transport the eggs to a protected hatchery, away from predators and poachers. When the time comes many weeks later, the baby turtles are released on the beach with enough distance to imprint on the sand while making their way to the waves, helping ensure their return to this same beach as adults. The hatchery allows sea turtle nests to incubate safely, without the risk of predation or poachers. 6:45 am – We release two Olive Ridley nests containing around 100 turtles. All of them safely reach the waves, some faster than others. Crossing the open beach is often the most difficult part of the turtles’ journey. With this relocation and careful release, we help provide a safe passage for the tiny turtles across the beach and increase their chances of survival. In the wild, it’s estimated that only 1 in 1,000 makes it to adulthood. As the waves crash onto the shore and sweep the sea turtles into the water, you can see their tiny black heads bouncing up and down and then diving down under the current. 8:00 am – We make it back to the biological station and fill up on some beans and rice, a staple in our diet. 11:00 am – I spot some leaf cutter ants working away carrying their characteristic green pieces of leaves, sometimes as much as three times its weight. One after another, they move along, wearing away the grass and carving unbelievable paths along the forest floor. 12:00 pm – We eat a much-needed delicious meal of rice, beans, salad, banana chips and a glass of fresh lemonade. 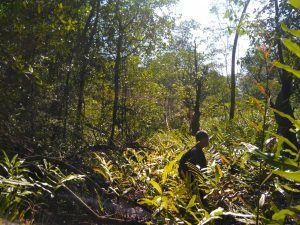 1:00 pm – I head out on a trail with Sam to conduct field research on spider monkeys and their “latrine sites.”. We hike for about 40 minutes until we reach a turn in the path under a large tree. Spider monkeys prefer to sleep in trees with interlocking branches near their feeding trees and choose one spot where they all excrete their waste, also known as a “latrine site.” All day, they jump around from tree to tree, snacking on fruit. As a result, we can tell the diet of the spider monkey by going through their waste. The spider monkeys, thus, become primary seed dispersers and the “latrine site” can be identified by many tree saplings growing in one area. 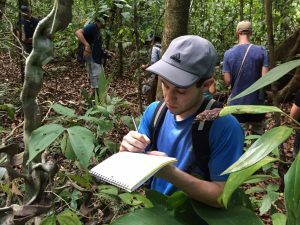 2:00 pm – Our task was to observe the spider monkey poop and notice if ants appeared – which in theory, should attract poison dart frogs. Although field biology can seem repetitive and boring at times, it is extremely rewarding when you find what you’re looking for after patiently waiting. Great to see your work pay off! As we sit there taking notes, I listen to the sounds around me and start to notice small things in the forest. A dung beetle crawls by, proudly rolling his perfect spherical ball of monkey poop. The beetles are a lot smaller than I had imagined but the impact they have on the forest as secondary seed dispersers is extraordinary! 3:45 pm – A howler monkey starts to howl near us. Sam tells me that howlers howl for only a few reasons: As a “wake-up call,” an “I’m going to sleep” howl, a “territorial” scream, and an “I’m wet and mad about it so I’m going to complain” cry. By this time, the rain had started coming down. We hadn’t felt it much before because the trees had caught most of it. But soon it got darker out and the rain got stronger. so we headed back. The rest of the evening was composed of relaxing, showering, preparing and eating dinner, and getting to bed early for an early morning. The cold refreshing shower was definitely a highlight of my day along with the fresh pineapple with dinner. Celebrating Endangered Species Day! Endemic and Endangered: Stories of a frog and a tanager. What does a Golfodulcean Poison-arrow Frog and a Black-cheeked Ant-tanager have in common? 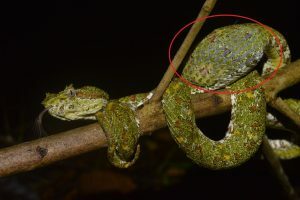 Not only are they endemic to the Osa Peninsula in Costa Rica, but they are also endangered – a term used to describe when there are so few individuals surviving that the species is at risk of no longer existing in the wild. There are many reasons that could drive a species to this status, including: habitat loss, illegal pet trade, introduction of exotic species, diseases, illegal hunting or overfishing. 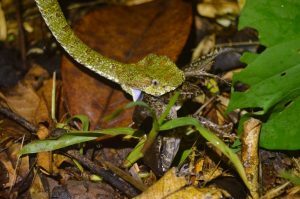 Why does the Osa have so many endemic species? 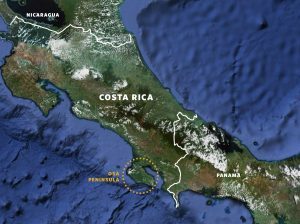 Because of its geological formation where it evolved as an island before merging with the Costa Rica mainland (nearly 2 million years ago), the Osa Peninsula harbors a high level of endemic species. Endemic species are those which are found exclusively in one location in the world. 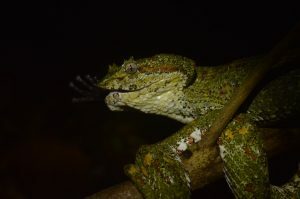 This endemism, together with the immense concentration of life forms found in this region, is the reason why the Osa is globally known as a biodiversity hotspot and has such an important conservation value. Why are these endemic species endangered? 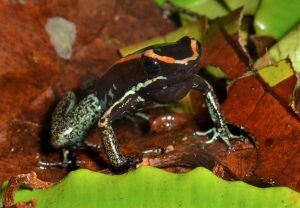 Although the Golfodulcean Poison-arrow Frog and the Black-cheeked Ant-tanager can be found in areas close to the Osa Peninsula, populations are isolated, and in the case of the frogs, are considered a rarity. According to the IUCN Red List of Threatened Species (2017) both species are endangered because of their small distribution range, confined to protected areas, where logging and continuously habitat loss around these areas are the major threats to both species nowadays. 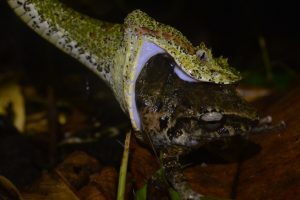 In the case of the frog, water pollution due to gold mining in the Osa is also a huge threat. What is it like to experience these endemic & endangered species? If you have never had the chance to explore nature in the Osa and see these animals, I invite you to go on an imaginary hike: It´s 5:15 am and we embrace an early morning hike into the rainforest. 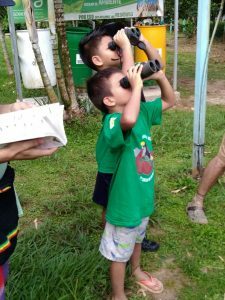 Binoculars in hand, a nice flute-like sound indulge our senses: it is the Black-cheeked Ant-tanager, but we have not seen it yet. This bird performs this particular song only in the early morning, sometimes accompanied by the howler monkeys´ chorus. Time passes and a chatter-like sound captures our attention. Should we look up to the canopy? No, we better focus in the understory, where this species inhabit. 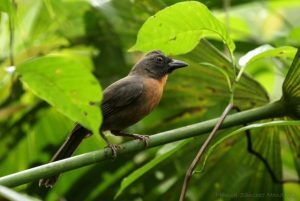 As all tanagers, the Black-cheeked Ant-tanager fly in family groups and forage in the lower levels of the forest in search of small arthropods and fruits- a behavior that makes them important for controlling defoliating arthropods and also for dispersing seeds. Wait! 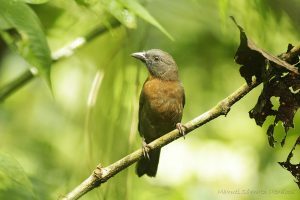 Be careful with these bunch of army ants passing through the trail; let´s find a good place to enjoy the show: the Black-cheeked Ant-tanagers are following the “ant swarm” with a mixed flock. We watch for 10 minutes until they disappear in the vegetation, following the path of the ants. As we keep walking in the rainforest another sound captures our attention: the Golfodulcean Poison-arrow frog- a diurnal species (active both day and night). We can hear two calls but they are far away; maybe if we move towards a creek we can find them. Indeed, as we approach a small creek, we spot two males calling together on top of a log! These frogs are very territorial and we are witnessing a territorial display. Their colors (known in biology as aposematic coloration) are warning us that they are highly toxic. Continuing our walk along the creek, we find another male, but this time carrying tiny larvae on his back. He will soon deposit them in the water for their next life stage. Our hike concludes and we are thrilled to have successfully found these two endangered species that can only be seen in the Osa. Experiencing nature is one way we can understand the importance of protecting endangered species. Each species, endangered or not, has a role to play in the greater ecosystem, whether by dispersing seeds, controlling other species, or by directly helping other species maintain the ecosystem health. 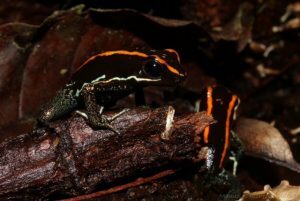 These two endemic species- the Golfodulcean Poison-arrow Frog and the Black-cheeked Ant-tanager- are also important because they act as umbrella species. This means that if we protect their habitat we are also protecting the habitat of other important species, including other endangered animals and plants as the Jaguar (Panthera onca), the Scarlet macaw (Ara macao) and the Nazareno or Purpleheart (Peltogyne purpurea) found in the Osa. Is it too late? Not yet! Do we still have time to save the Golfodulcean Poison-arrow Frog and the Black-cheeked Ant-tanager? Yes, but we need ongoing efforts to conserve the vital ecosystems that support these animals and the surrounding biodiversity. 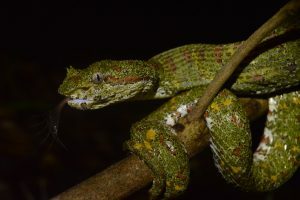 Because these species are restricted to protected areas and they know no political boundaries, it is even more important to prioritize the buffer areas, forest patches and biological corridors that connect their habitat and are the last stronghold for their survival. Please help Osa Conservation continue to save these amazing species and so much more! 100% of your donations goes toward helping conserve the habitats and ecosystems on which these species and so many more rely! You can visit our page here to make a donation or visit here to learn about visiting the Osa and seeing these incredible creatures for yourself! Every effort counts! Hello everybody! My name is Alexander Cotnoir, and before I share a snapshot of my work at Osa Conservation thus far along with some of the most exciting experiences I’ve had working with the Ríos Saludables Program, I’d like to introduce myself and share why I decided to join the Ríos Saludables Program as a volunteer over the course of the next few months. I am currently a sophomore at Dartmouth College in New Hampshire, pursuing a degree in biology and environmental studies. Despite my current academic pursuits, my passion for ecology and sustainable agricultural/development practices started long before my entrance into higher education. During my childhood, I enjoyed fishing, hunting, swimming, and exploring the great outdoors along the Quebec border in northern Vermont, and later working for a local branch of the U.S.D.A. and birdwatching with my sister. My passion for the intersection between land use practices, native/local cultures, and conservation was fostered through summer jobs (as a Nutrient Management Plan Intern for the U.S.D.A.’s Natural Resources Conservation District), where I worked with farmers to minimize nutrient loading from dairy farms into local watersheds. I have also fostered an interest for conservation and land-use through conversations with my grandfather, who is a Tribal Leader of the Coosuk Band of the Abenaki Nation working to manage our tribal lands in northern Vermont. At Dartmouth, my interests expanded with courses ranging from “Writing Natural History,” to “Climate Change and Agriculture” and “Native Peoples and Environmental Change” which have allowed me to explore the socio-cultural and economic aspects of environmental problems. 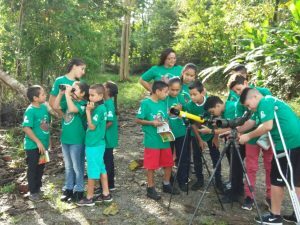 As I was searching for an off-term opportunity to gain field experience in biology and environmental science, the Ríos Saludables Program appeared to be the perfect opportunity. 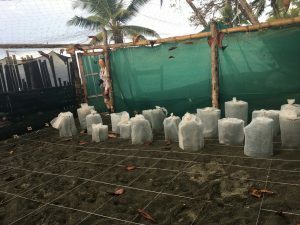 Given my previous experiences with macro-invertebrate sampling and hydrological systems, I knew the Ríos Saludables Program would be an ideal opportunity to continue exploring watershed science, as well as to gain new insights into community-oriented conservation initiatives in a foreign country. 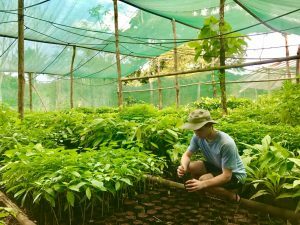 Aside from my interests in gaining field experience, becoming involved in a community-oriented conservation program, and applying my studies in biology and environmental science, I also saw volunteering with Ríos as an amazing opportunity to practice my beginning-level Spanish, and to explore the amazing flora and fauna that call Osa’s rainforests home. Although I’ve only been living at Osa Conservation’s biological station for three weeks, I have already observed that the Osa Peninsula rightly deserves National Geographic’s description as the “most biologically intense place on earth.” Within my first week and a half, I spotted scarlet macaws, toucans, black-throated trogans, green and Olive Ridley sea turtles, a false coral snake, four species of monkeys, peccaries, a tamandua, and even a puma that decided to walk down one of the forest trails in front of me (I was told that this is a rare sight that many locals often don’t see in their lifetimes!). 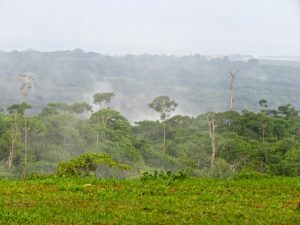 Aside from feeling an immediate sense of awe at the plethora of flora and fauna that inhabit the vibrant forests around the biological station, I’ve also found the local community’s excitement about their unique natural landscape very refreshing and conducive for fostering discussions about plants, animals, and conservation initiatives alike. Despite the many mistakes I make using my Spanish, I have never felt embarrassed because the people are all so kind and appreciate the attempts of Spanish beginners. Thus far, one of the most exciting experiences working for the Ríos Saludables Program was a trip Rachael and I recently took to sample near a springhead feeding water to a community in Venegaz. 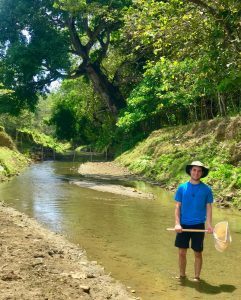 Aside from the breathtaking beauty of the Costa Rican countryside, with its winding red-dirt roads carving their way through farmsteads and massive ajo trees, I had a great time sampling macroinvertebrates with Rachael and a local community member who joined us at the stream. 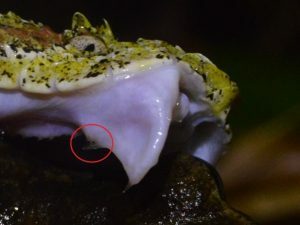 Almost immediately after we arrived at the sight, I spotted a green and black poison dart frog hopping in the leaves beside the brook, which the gentlemen excitedly identified for us and shared some of his expertise on the animal. The entire time we spent sampling the stream was enjoyable due to the gentleman’s enthusiasm, my attempts to explain nitrate tests in Spanish, and the tangible connection between watershed and community health that was evident as we sampled near the springhead water collection tank. Over the course of the next two months, I hope to help standardize Ríos Saludables protocols so that the sampling data can be applied to a larger academic context. I also look forward to doing community outreach with students and local community members, and finding ways to better assess the impact of agricultural activities and road crossings near Puerto Jiménez. I am also excited to help establish watershed testing locations along several additional rivers in the area. 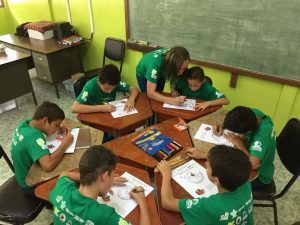 Interested in volunteering with Osa Conservation? Learn more here about our various volunteer opportunities!